As we get closer and closer to Christmas, you probably want to fill your home with lots of holiday cheer. One of the best ways to do that is with spirited decorations. By putting holiday decor throughout your home, you can create a type of atmosphere that gets everyone really excited about all the great aspects of this season. As a household with pets, it’s normal to want to include them in the holiday festivities whenever possible. While that’s definitely a good plan, one thing to keep in mind is your pets may have different feelings about certain holiday decorations. Instead of simply wanting to look at decorations, your pet may want to play with decorations or even be tempted to eat them. And as you may have guessed, some items can be quite dangerous if consumed. From specific ornaments to the tree itself, there are a number of things about this decoration that may catch the attention of a dog or cat. Keeping pets away from all of these temptations can be a challenge, especially if your pet is young. That’s why we recommend putting your tree in a room your pet can’t access unless you’re also there to supervise. Many different types of holiday decorations utilize electric cords. Chewing can be a danger to pets, which is why you’ll want to try keeping cords out of reach and monitor any that are accessible for signs of chewing. And if you have any ornaments or other decorations made from glass, it’s best to put them out of reach of your pet to prevent any breaks and subsequent cuts. Just like all the other special people in your life, it’s a lot of fun to get presents for your pets and then open them together. If you’re currently trying to find some great gifts, be sure to take a look at our pet treats and pet care products. 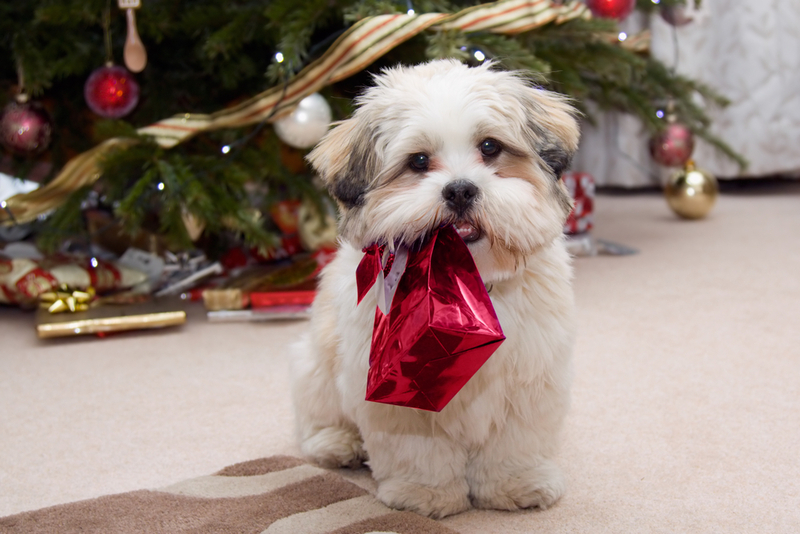 The one important caveat about any pet present with a smell is even if it’s securely wrapped, your pet may pick up the scent. And once that happens, they’re going to be tempted to get inside. Because you don’t want to come home to multiple packages that are shredded open, be sure to keep any pet presents that may have a scent in a more secure part of your home until it’s time to actually open them. This is also true if any gifts for other members of your household are food products or other items with a strong smell. By being strategic about where you place your Christmas tree, using caution with electric cords & glass decorations and securing any presents that your pets may be tempted to get inside, you can keep your pets safe while also enjoying all your holiday decor to the fullest.